Plumetot airfield (French: Plumetot aerodrome, also known as Mathieu aerodrome, Cresserons aerodrome or Advanced Landing Ground B-10 Plumetot) was an airfield was an airfield near Gold Beach on the Normandy beachhead in France. The airfield, located 10 kilometers north of Caen, was built by the French government in 1938-1939. It was little used during the 'Phoney War' period of 1939-1940 however. After the German breakthrough in the Ardennes in the summer 1940, the Allies evacuated 'Mathieu aerodrome' as it was known at the time. A number of RAF aircraft could not be repaired before being flown back across the English Channel and were destroyed to stop them falling into German hands. Between June 1940 and June 1944 the Germans took possession of the airfield. A number of the German aeroplanes crashed here during the occupation, in part (it is believed) because the aircraft were older and poorly maintained having been brought back from the Spanish civil war. For the Germans, Mathieu/Plumetot aerodrome was not a high priority and they did in fact cultivate crops and graze cattle on some of the requisitioned land. Also, they did station some anti-aircraft guns to the north at Cresserons, to protect the aerodrome from Allied aircraft. 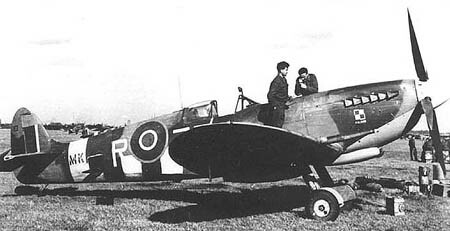 For the Allies, one of the main strategic targets in the Caen sector was the capture of Carpiquet aerodrome. Located to the west of the city, most historical accounts of the Battle of Normandy refer to the planned capture of Carpiquet aerodrome. Although few, if any, researchers refer to it, the Allies must also have been aware of the existence of the smaller Mathieu/Plumetot aerodrome and its potential importance in any battle. The Germans must have recognised it, because they dug an anti-tank trench across the airfield and planted 'Rommel's Asparagus' on the field. The British 26 Field Hygiene Section (26 FHS) first camped next to the Plumetot airfield late on Saturday 10 June. Because the front line between the Allies and the Germans was so close to the edge of the airfield, sniper activity often made it difficult to carry out work. Beside the 26 FHS camp at Plumetot, there was also a Royal Canadian Air Force (RCAF) encampment. They set about restoring the airstrip so it could be used in winning the battle. 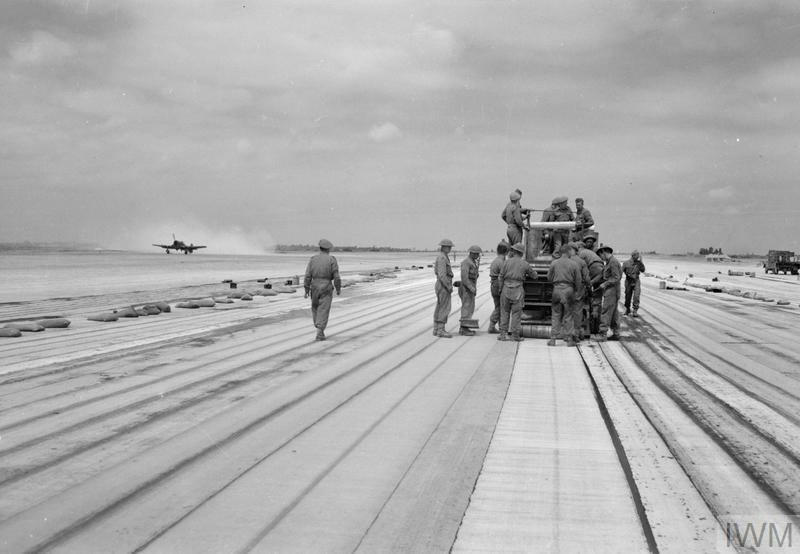 On 18 June 1944 engineers began laying out an asphalt matted landing strip. B-10 appears to have been the only english airfield given an asphalt matting surface, at a length of about 1200 metres. 123 Wing (198 Sqn and 609 Sqn with Typhoon) began using the airfield on 1 July 1944 and remained at the airfield until the 19th. Three squadrons of 131 (Polish) Wing (302 Sqn, 308 'City of Krakow' Sqn and 317 Sqn with Spitfire XIb) followed from August until September. 35 Recce Wing (2 Sqn with Mustang II, 4 Sqn with Spitfire XI and 268 Sqn with Typhoon FR 1), 135 Wing (33 Sqn) with Spitfire IXE and a Spotting Wing (652 squadron) with Auster Mk IV AOP also used the airfield. For the French, one particular landing stands out, that of the Free French fighter-ace Squadron Leader Yves Ezzano who was attached to 198 Fighter Squadron of the RAF. To the French people, Squadron Leader Ezzano was 'one of their own', helping to liberate their land. Even a few Lancaster Bombers were able to land after finding themselves in difficulties after bombing sorties. On 4 July 1944 Squadron Leader N.A. 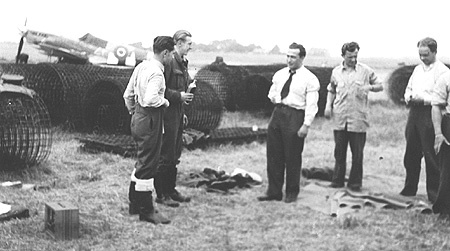 Williamson, DFC, RAF was interviewed by BBC Radio after having had to make an emergency landing on 'a fighter strip in France'. At the time, references to specific locations were often omitted from radio reports to avoid giving information to the enemy. However, evidence suggests this 'fighter strip' was in fact aerodrome B-10 Plumetot, because that same day, 4 July 1944, the BBC also broadcast a talk by the Canadian C.O of Plumetot aerodrome. Given the circumstances in Normandy at the time, it is likely the BBC did not travel between airfields for their interviews. 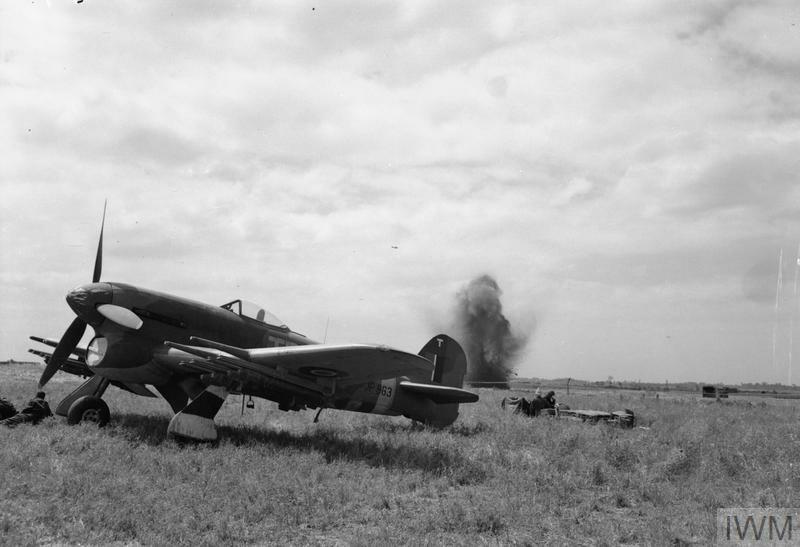 There is a transcript of the Wing Commander’s 4 July broadcast, in which he talks the about airfield being the closest to the front line, the Germans shelling the aerodrome and men going about their duties and writing letters home. Newsreel films shows they really have. Another Lancaster bomber landed at Plumetot on 7 July after taking part in dropping 2500 tonnes of bombs over the northern suburbs of Caen. By 19 July Caen was completely liberated and German activity around Plumetot appeared to diminish. However, more than fifty years after the end of the war, evidence came into the public domain that proved the Germans still retained an important interest in the aerodrome, particularly because the airstrip had a hard surface. 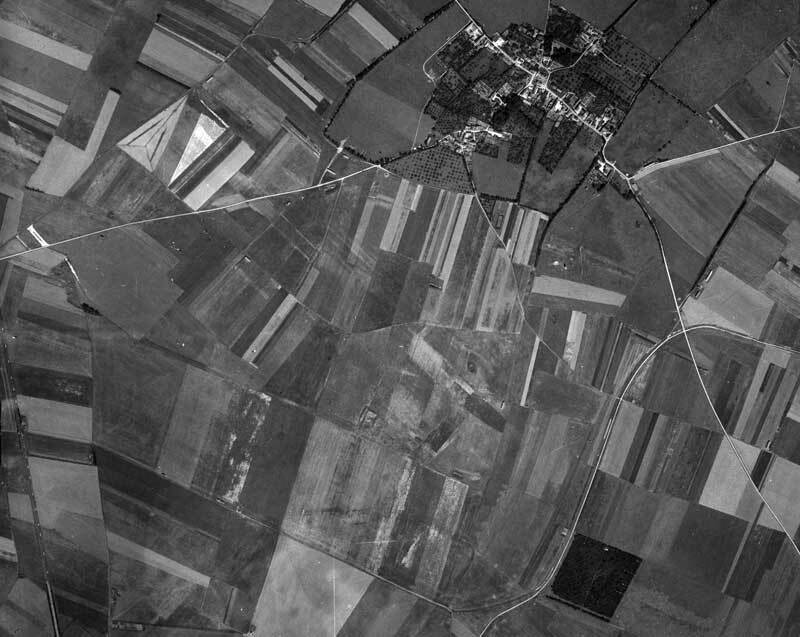 In early August 1944, one of the first reconnaissance jet aircraft, an Arado 234, took aerial photographs at a height of 30,000 feet of all nineteen Allied airfields in the Normandy battle area. In German photos, Plumetot was designated as number '1023'. The photographs were taken back to Germany awaiting instructions about what to do next. However, despite being able to obtain detailed knowledge of the airfields, the Germans no longer had the capacity to do anything about attacking them. The Allies captured these photographs as they moved into Germany in 1945 and they were placed in the American Archives. Some of the villagers living near the aerodrome have researched its history and have obtained copies of the German reconnaissance aircraft photographs. The RCAF and the 26 FHS encampments are clearly visible. After the Allies broke out of Normandy, the airfield continued to be used as an ammunition storage until the end of the war. Shortly after the war, the airfield was completely demolished and the lands were returned to their owners for their former use as farmland and an apple orchard. Today, it cannot be distinguished from the other farmland plots in the region.